How about starting the new year with an incredibly performant 4K WiFi-based action camera that comes with a hugely impressive 50% discount? Of course, you’re interested. Anyone who has ever entertained the idea of an action camera will have likely arrived at the GoPro website. Whilst that hardware is generally considered the best-of-the-best, you are definitely going to pay over the odds for it and will find yourself spending more than $250 for a 4K action camera. 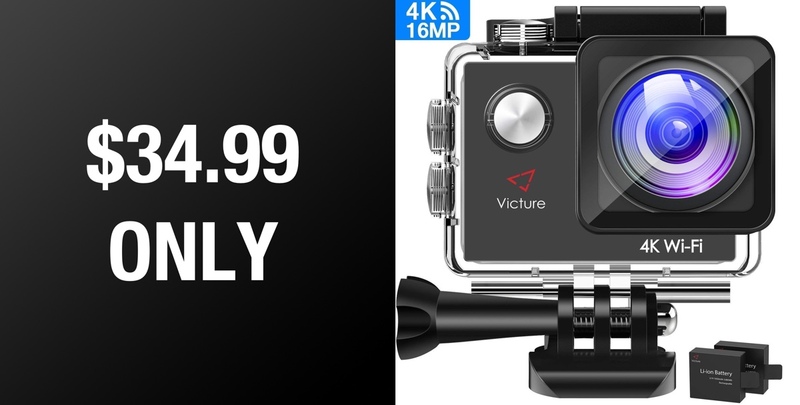 When you take a look at alternative options, such as this Victure action camera, you find yourself scratching your head at the huge gulf in different from a price perspective. So, if you stay away from a GoPro, you can grab this little beauty for just $34.99. What exactly are you going to get for that financial outlay? The camera comes with a 4K camera resolution with the ability to shoot and capture at 4K, 2.5K, 1080p, and 720p for those who want to save additional storage space. It also offers 16-megapixel still image capture and a 170-degree wide-angle lens that is capable of vividly recording pretty much anything your heart desires. The camera itself also offers adjustable exposure options to allow the user to manually change settings to improve the recording quality under specific lighting conditions. If you just want to point and shoot, then this is going to take care of your needs. But if you prefer having additional control, then the Victure also has you covered. It offers built-in WiFi and HDMI in order to immediately share the captured footage or send it directly to a television set via HDMI cable. 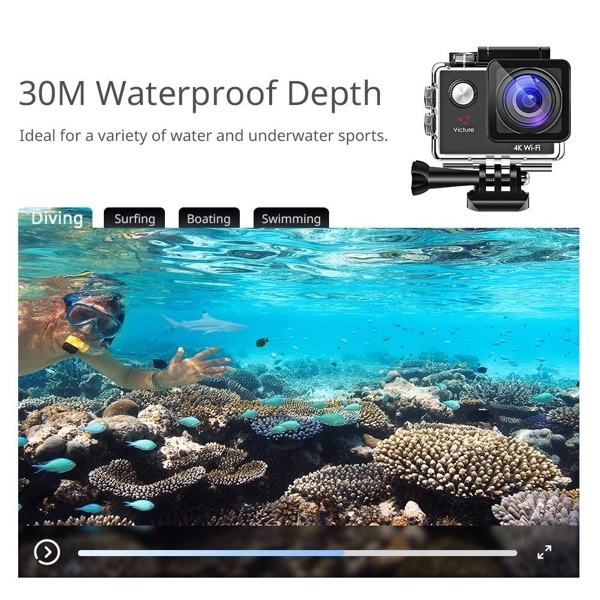 There is also waterproofing via its newly designed case, which means extreme sports fans can take this 30-meters underwater to capture stunning footage without any worries or concerns about it drowning. All-in-all, this is a great little recording option for anyone who is looking to get up and running with glorious 4K action without having to part with the type of money that GoPro – or similar – hardware commands. Grab it right now from the direct product link below and make sure to take note of the 7RSN549U discount code.